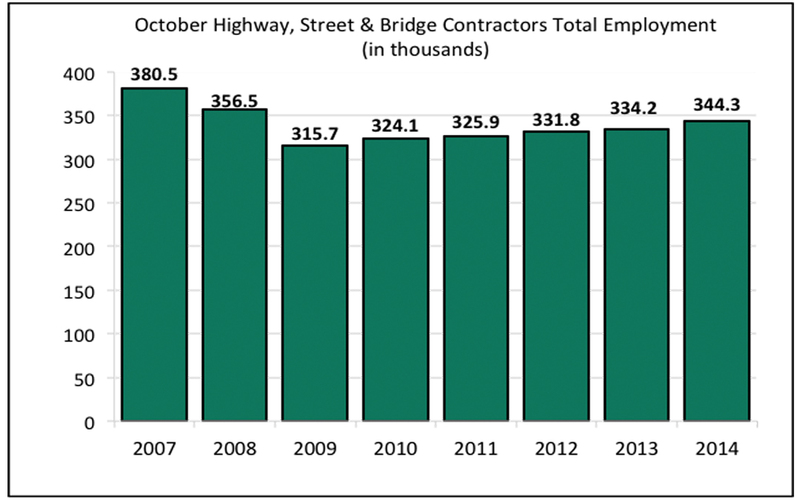 Highway and bridge contractors added 10,100 more workers to their payroll in October 2014 compared to October 2013, an increase of 3.0 percent, according to the latest data from the U.S. Bureau of Labor Statistics. The increase in employment is consistent with an uptick in highway and bridge construction activity since late 2013, when construction levels were historically low. As contractors have started to do more work, they have hired more employees to work both on the job site and in the office. Despite recent employment gains, the overall number of jobs in the industry is still well below 2008 levels, when the recession began. The outlook for highway and bridge construction employment in 2015 will depend on a variety of market factors, including contractor backlogs, the value of construction work and the overall economy.